The ej.unobtrusive.min.js file can be accessed from the following location, that can then be copied and referred in your application. The ej.unobtrusive.min.js script should be referred next to the ej.web.all.min.js file reference, since it is dependent on it. By default, it is necessary to add Script Manager code in the _Layout.cshtml file present within the ~/Views/Shared folder of your application. The main reason for referring the Script manager in _Layout file is that, it can be referred as common by all the View files present within your application. If unobtrusive is set to true in the application, the script manager can be excluded, as the control is initialized by using HTML5 attributes. Render the DropDownList control as follows in your view page and enable the unobtrusive mode in your application. When the above code is executed on the browser, the DropDownList control will be rendered with the following equivalent HTML DOM attributes created for it. Refer to the required jQuery validation scripts to perform Client-side Validation before postback, when the form is submitted. This can be enabled or disabled by ClientValidationEnabled key in app settings of web.config file. In this section, how to perform Client-Side Validation for DropDownList control with DataAnnotations attribute is explained. Define the view model for DropDownList control as follows. Four sets of files are needed to implement the Unobtrusive. Refer the above mentioned necessary scripts files in your layout.cshtml page. 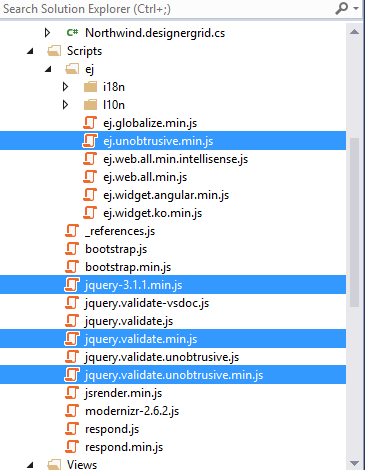 While creating a sample through Syncfusion ProjectTemplate or SampleCreator, the “ej.unobtrusive.min.js” file will be found in the “Scripts/ej” folder, whereas ,installing NuGet will ship the “ej.unobtrusive.min.js” file inside the “Scripts/ej/common” folder. Modify the script reference in the layout page based on this folder structure. •	data-val specifies that the DropDownList needs validation. •	data-val-required is the error message to be displayed, if a value is not provided. This is part of the magic of Unobtrusive: it uses HTML5-compatible “data-“ attributes to store all the information it needs to perform validation. This is why you don’t need to use any other code besides attributes to enable client-side validation with this library.